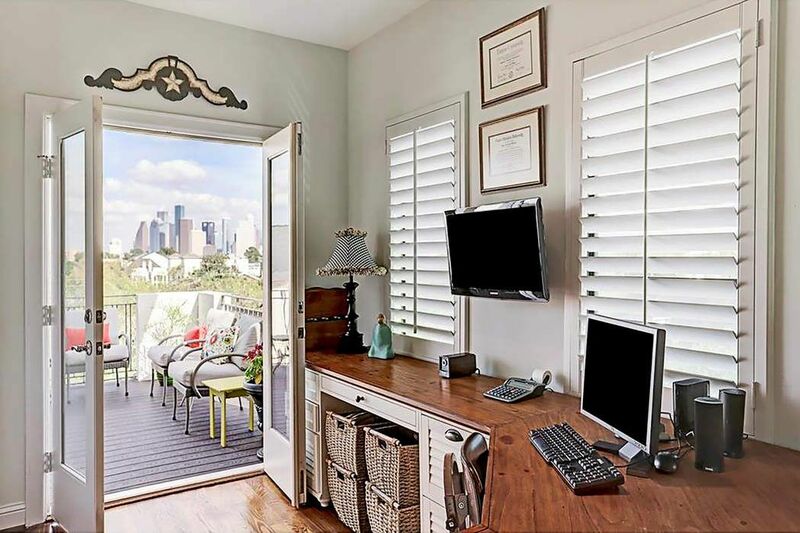 1602 Nevada Street, Houston, TX 77006 | Martha Turner Sotheby's International Realty, Inc.
Beautiful gated patio home community in the heart of Montrose. There is also a two car attached garage. 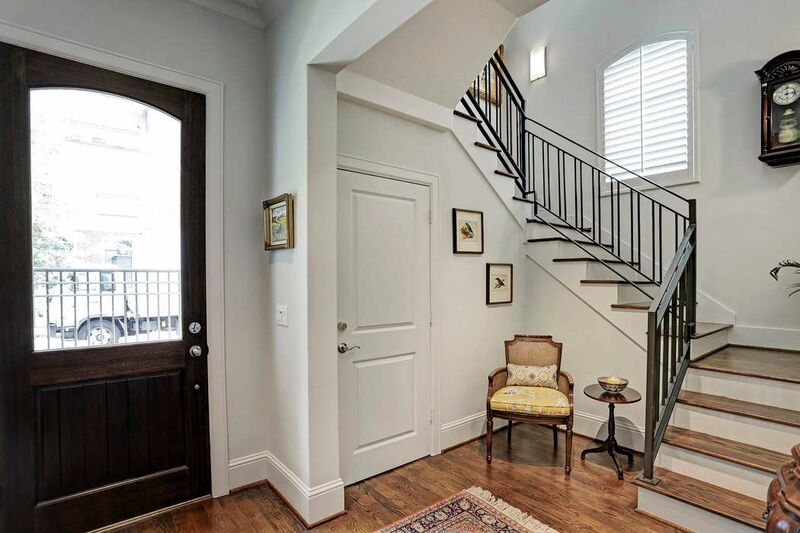 This home features remote control access via a pedestrian gate. 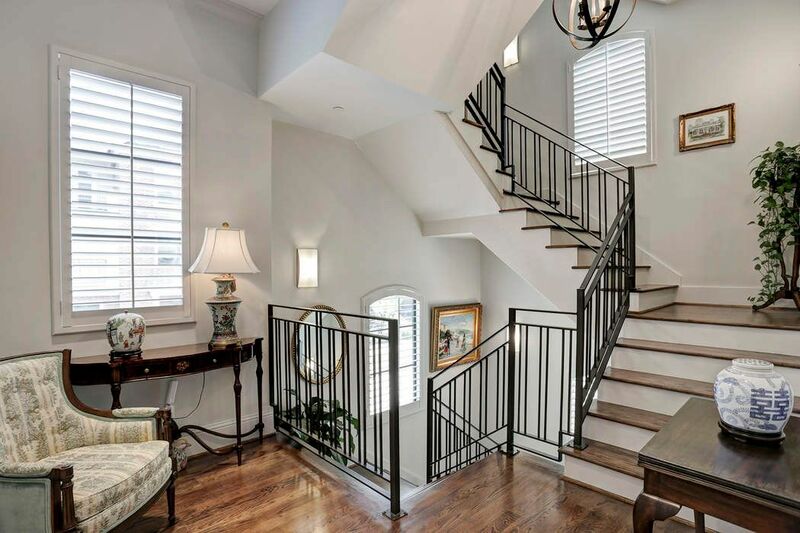 Enter into this home featuring recessed lighting, hardwood floods and under stair storage closet with a deadbolt. 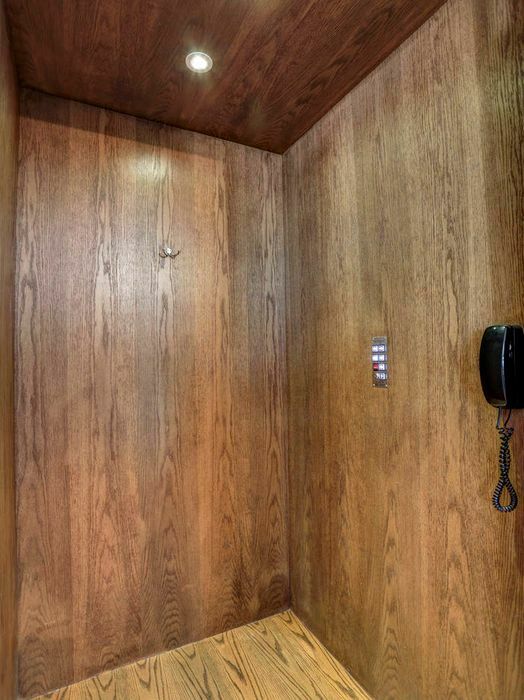 This home features a wood paneled elevator that services every floor of this home. The elevator has 8 ft. ceilings. 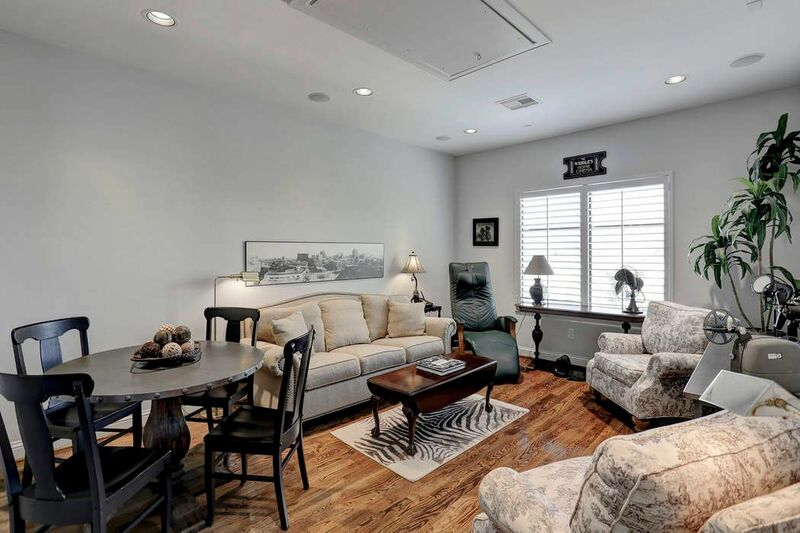 This home has plantation shutters and fire sprinkler system throughout the home. There is also a thermostat on each floor. 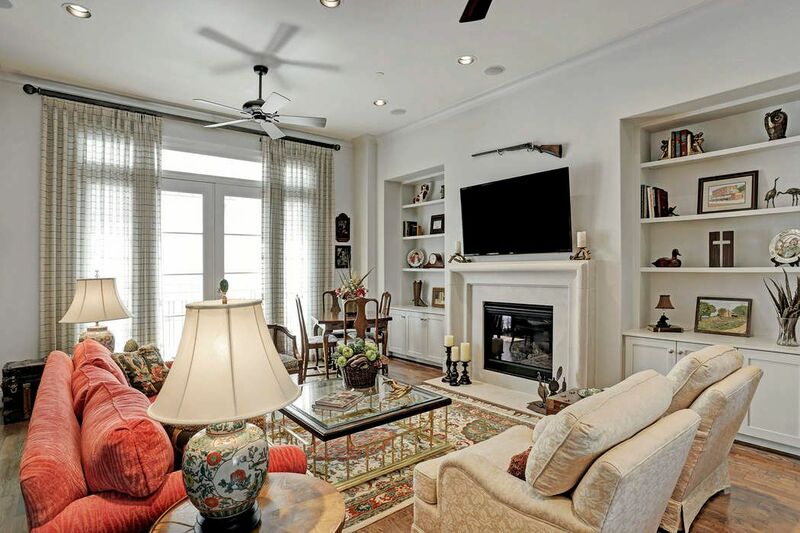 The bright and airy living room features a limestone gas fireplace with remote start and built-in shelving. Another view of the living room with 11 ft. ceilings. The dining room is open to the kitchen and living room. 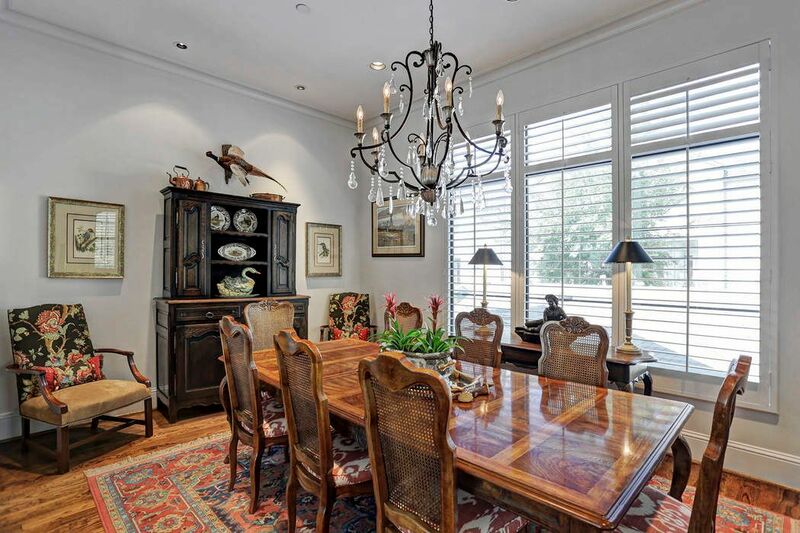 It features a chandelier, recessed lighting and hardwood floors. 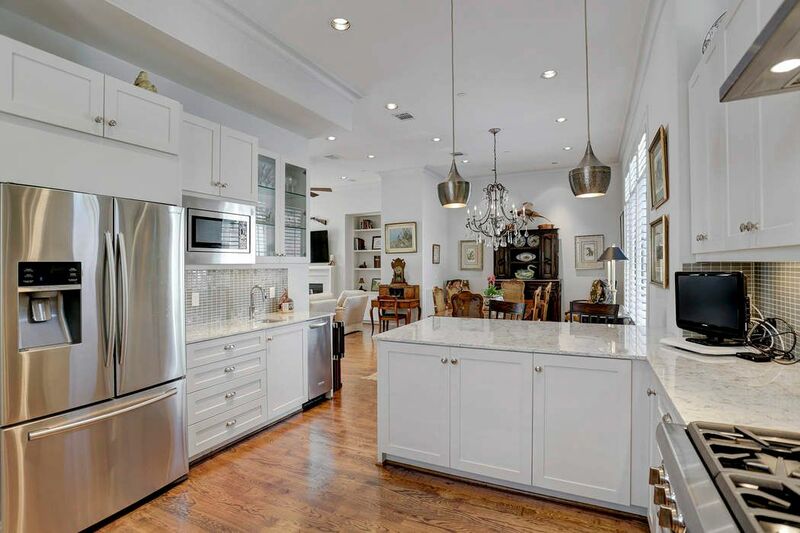 The kitchen has a large breakfast bar and wet bar. 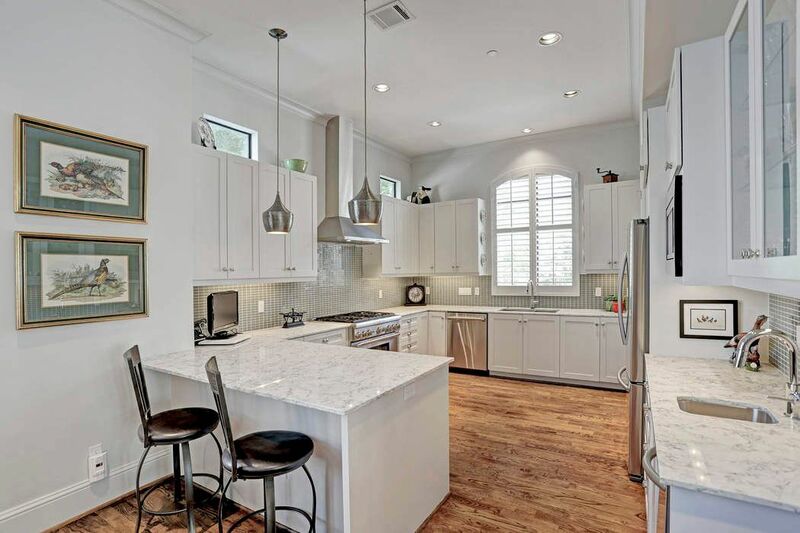 The counters are Caesarstone and there are custom wood cabinets. Another view of the kitchen featuring a Thermador 6 Burner gas range with vent and gas oven, hammered metal pendants, and a Whirlpool microwave. The kitchen also features a large pantry, soft close cabinet drawers and a Kitchenaid icemaker. 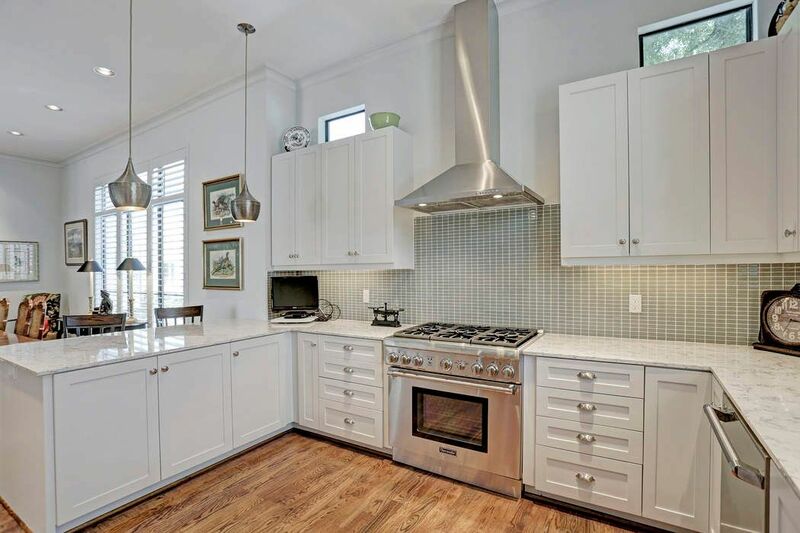 The upgrades continue in the kitchen with a deep stainless steel sink with disposal, Thermador dishwaser, hardwood floors, and recessed lighting. 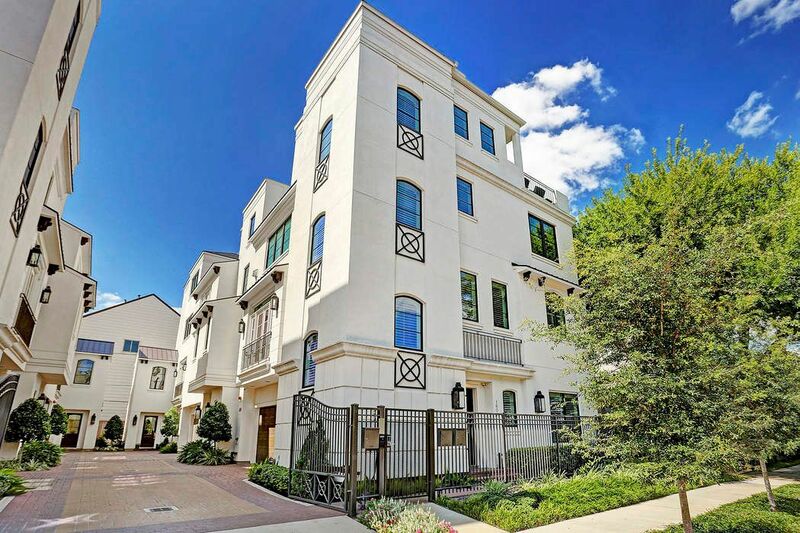 The elegant powder bath is conveniently located next to the living areas on the second floor. 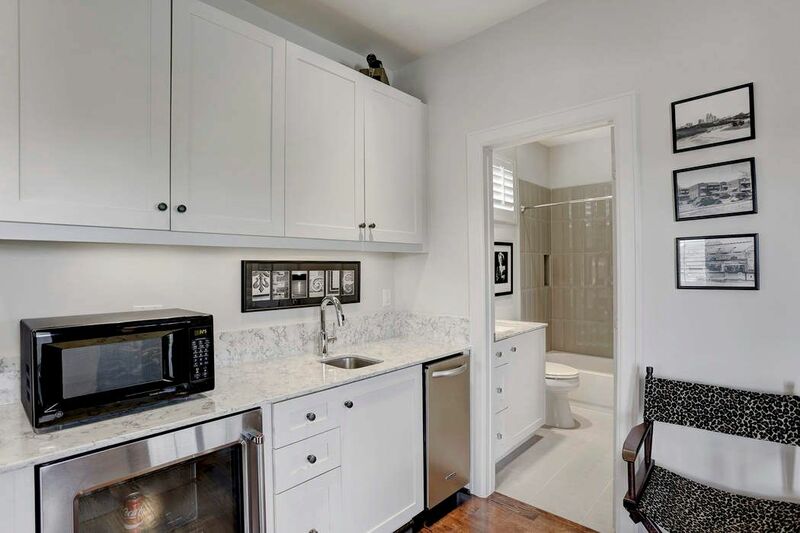 It has Caesarstone counters, hardwood floors and a comfort height toilet. 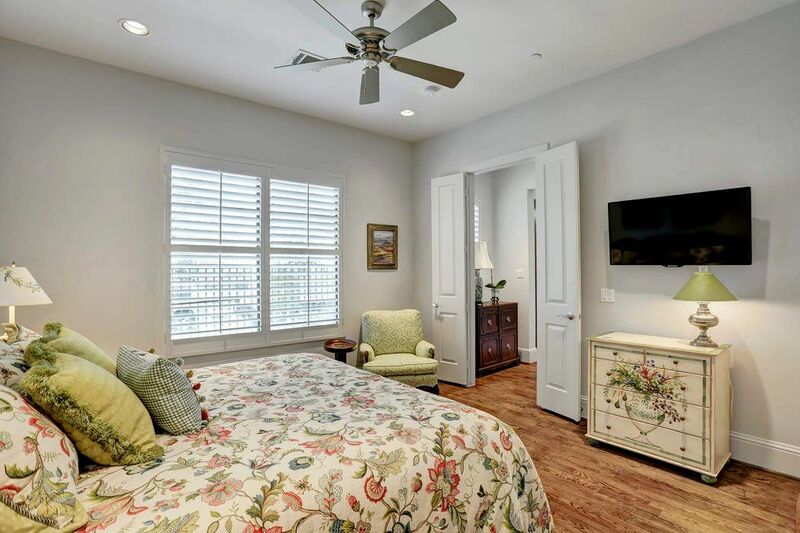 The spacious master bedroom features a large walk in closet and extra storage closet. 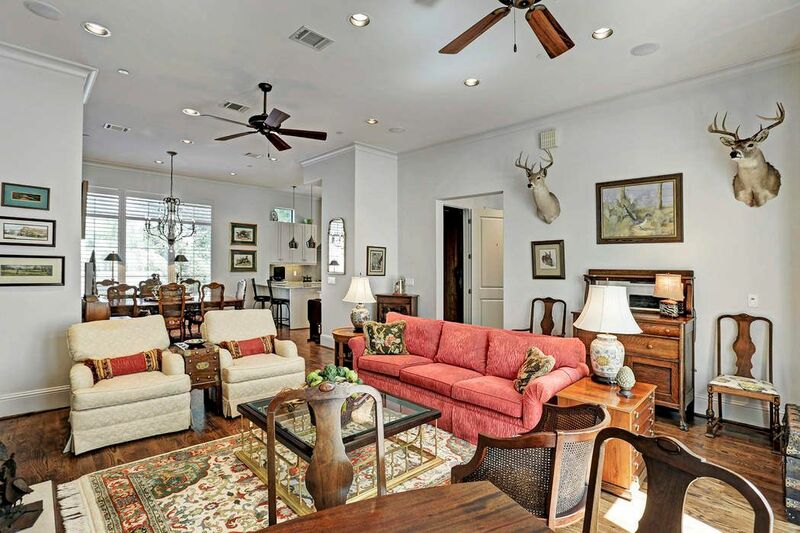 It has 10 ft. ceilings, recessed lighting, reading lights and hardwood floors. 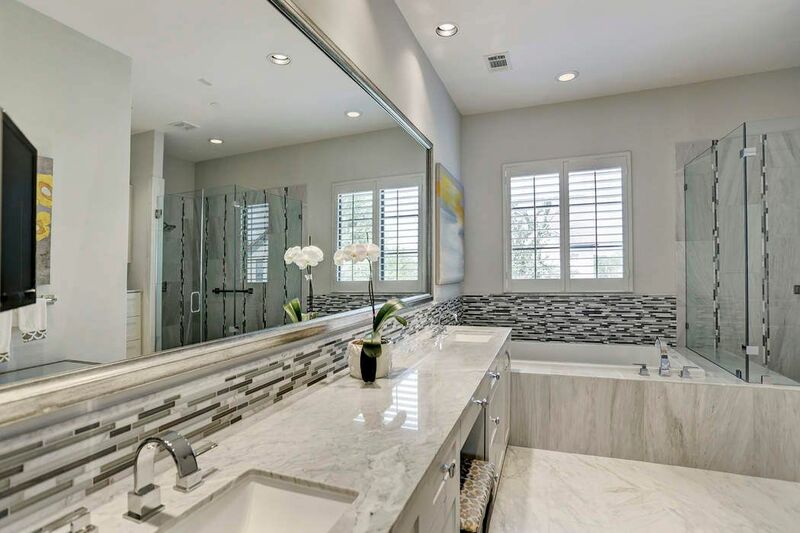 The stunning master bathroom has Carrera marble counters and frameless glass shower. 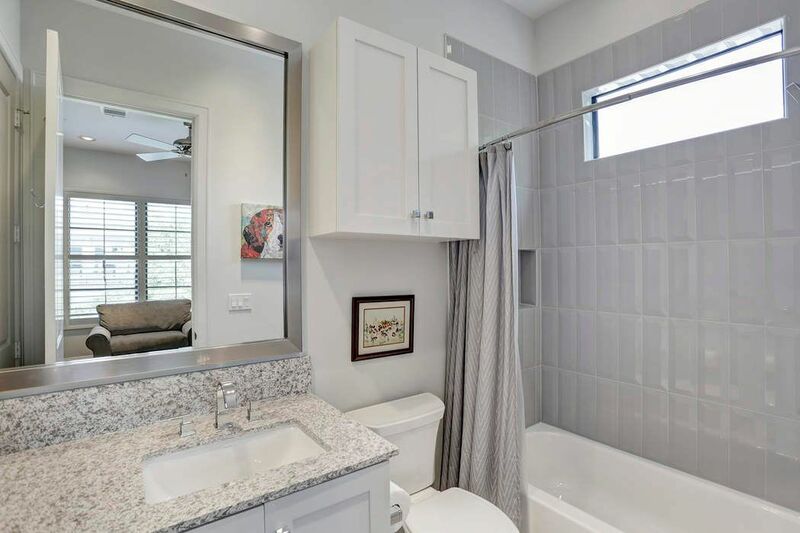 There is a large bubbler tub and private water closet. Another view of the master bathroom featuring views of downtown, separate his and hers dressers, recessed lighting and ceramic tile floors. 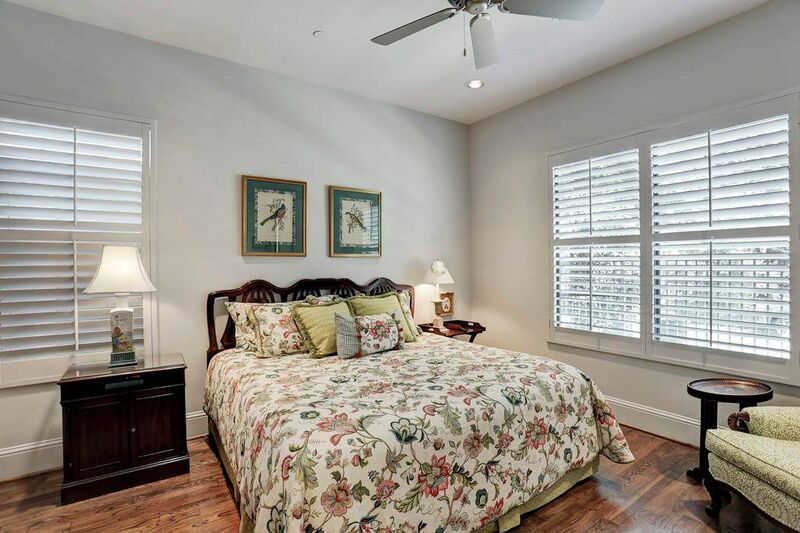 The first floor secondary bedroom features hardwood floors, recessed lighting and large closet. Another view of the first floor bedroom featuring an en-suite bath, ceiling fan and large windows. 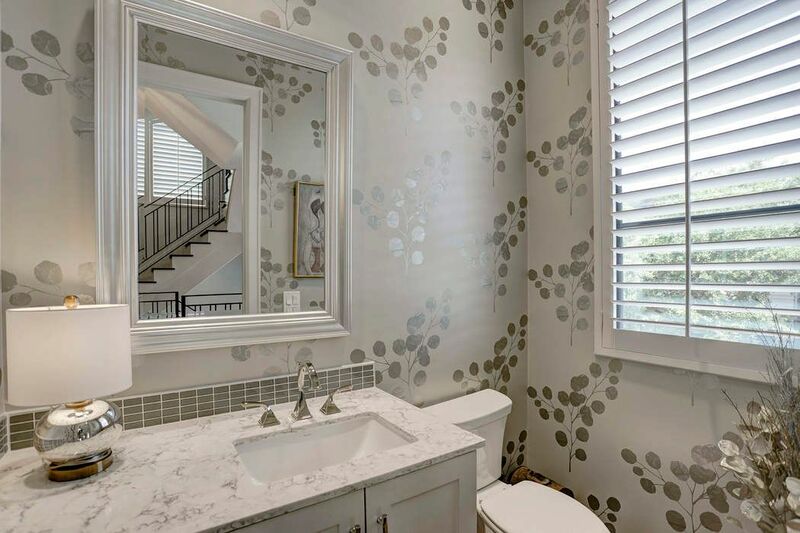 The first floor bathroom has a large walk-in closet, recessed lighting, tile floors and Caesarstone counters. 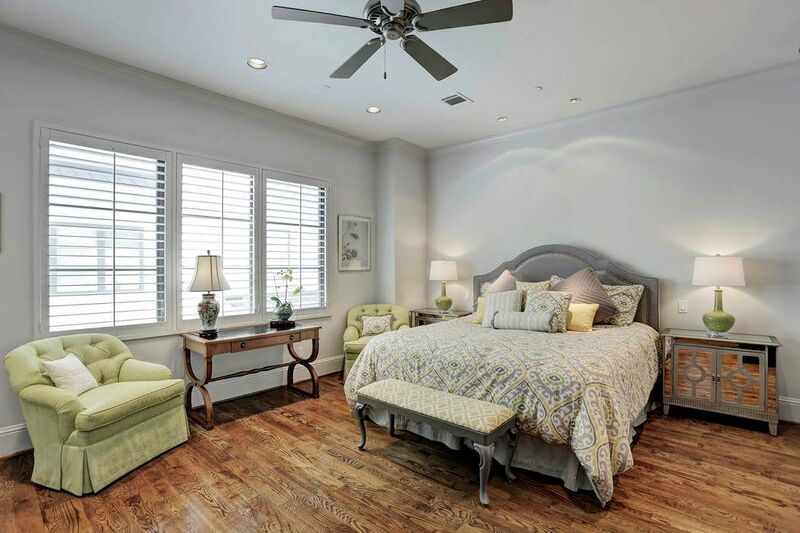 The secondary bedroom on the third floor features a large walk-in closet, en-suite bath and hardwood floors. 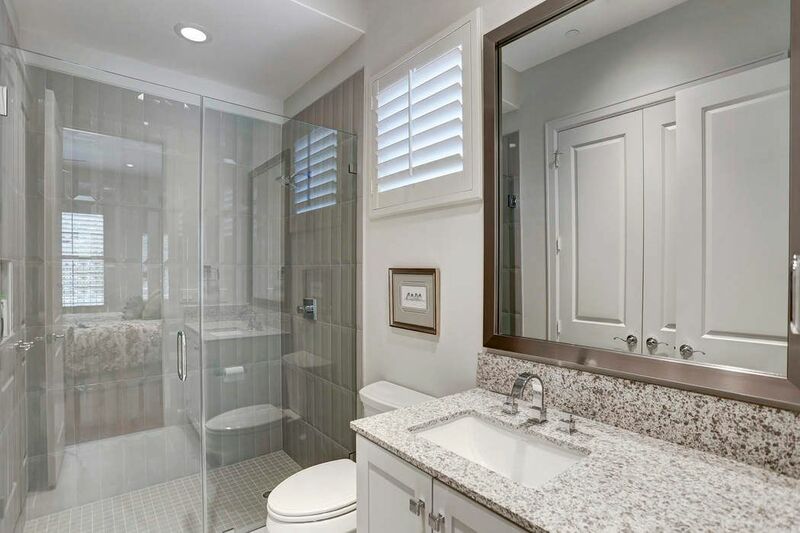 This en-suite bath features recessed lighting, Caesarstone counters, and tub/shower combination. The game room area on the fourth floor featuring recessed lighting, hardwood floors and wired for surround sound. The fourth floor wet bar offers convenient access to the game room and terrace. 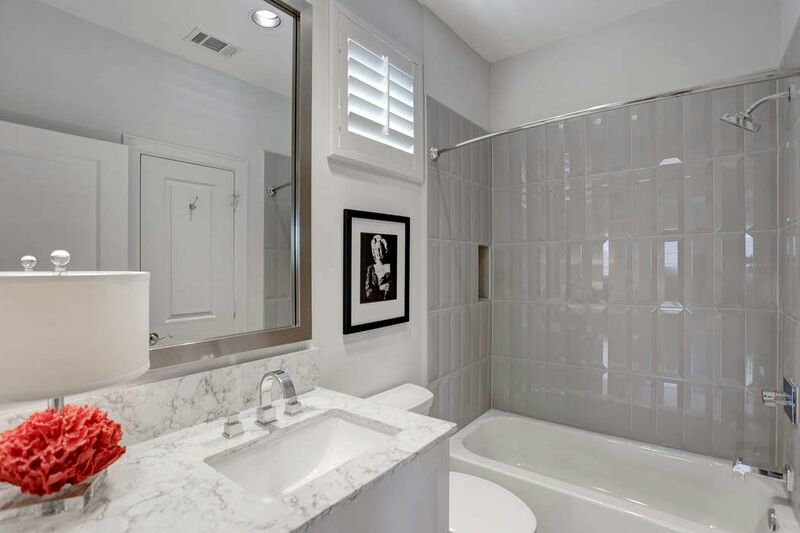 The fourth floor bathroom features Caesarstone counters, tile floor and tub/shower combination. The fourth floor terrace is partially covered with recessed lighting. It also features a TV outlet and gas connection. The study area on the 4th floor, makes a great office with a lovely view out to the terrace. 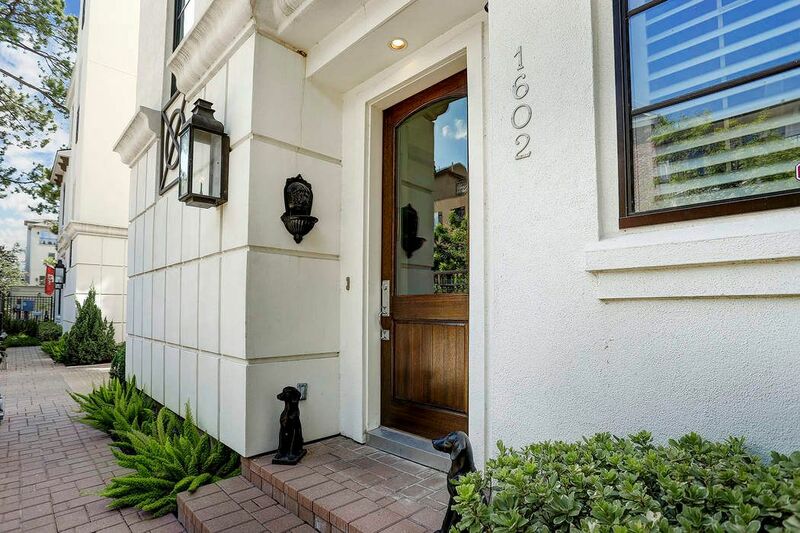 $875,000 3 Bedrooms3 Full / 1 Partial Baths3,359 sq. 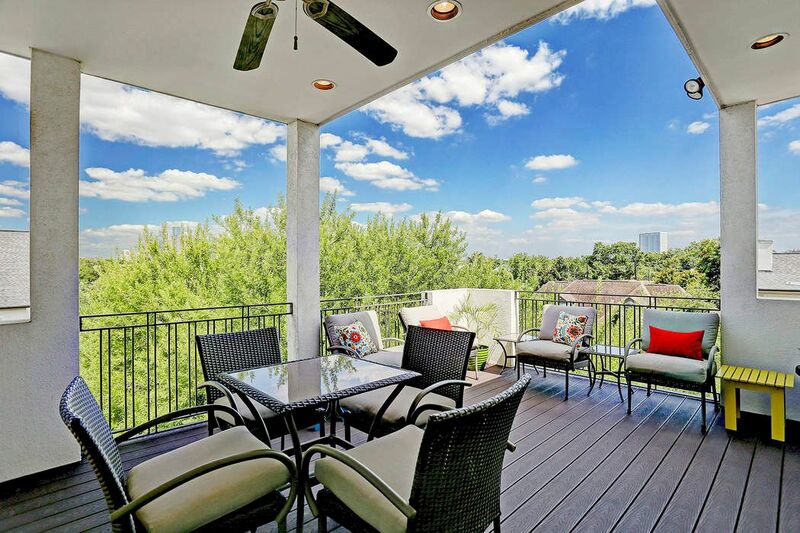 ft.
City living at its finest near Downtown in secluded low maintenance gated community. 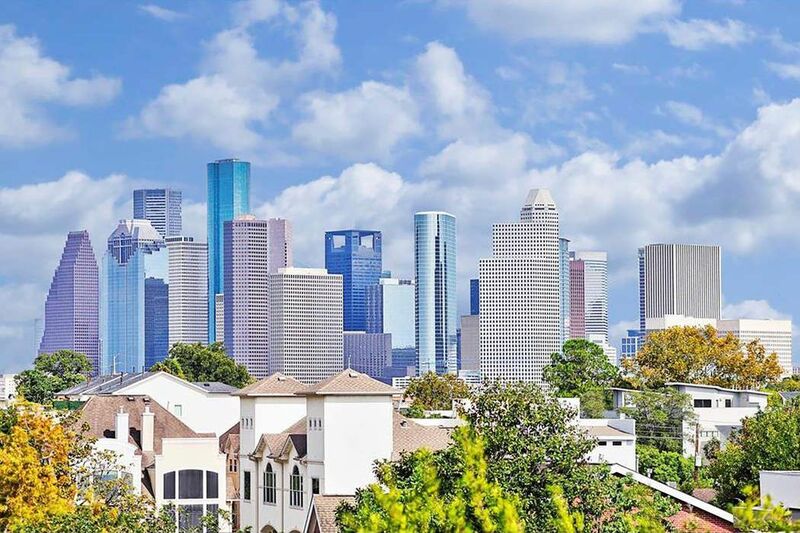 Stunning view of skyline from fourth floor terrace. Three bedrooms with private baths and a versatile room which can be quarters with full bath or media/study. 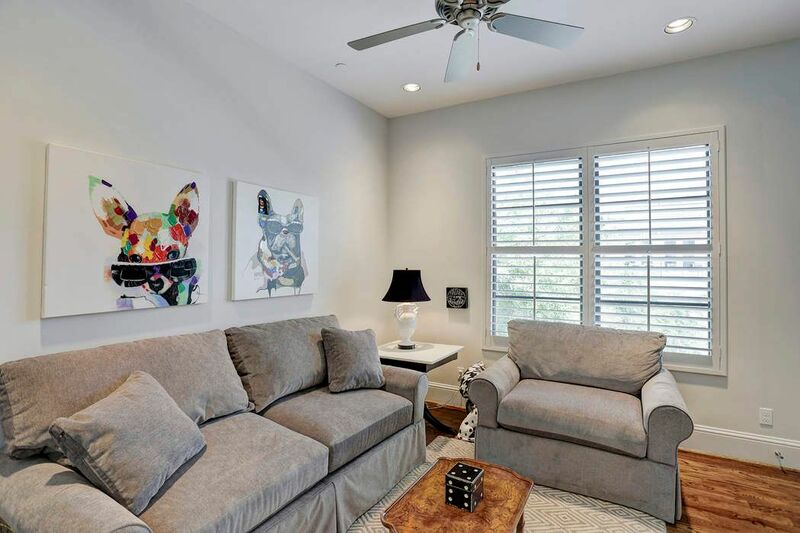 This open plan has high ceilings, hardwood floors and plantation shutters. Upgrades galore. Elevator/alarm/cameras/two wet bars. 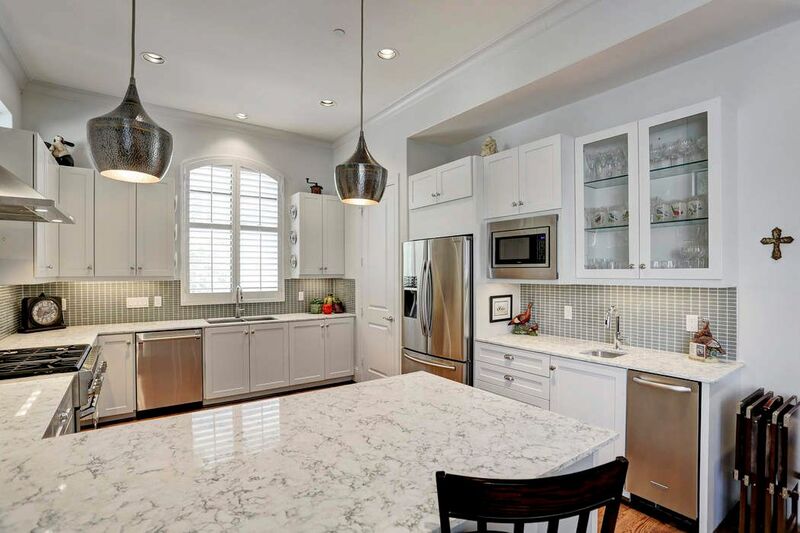 Kitchen features Thermador stainless steel appliances, including gas range/oven and quartz countertops. 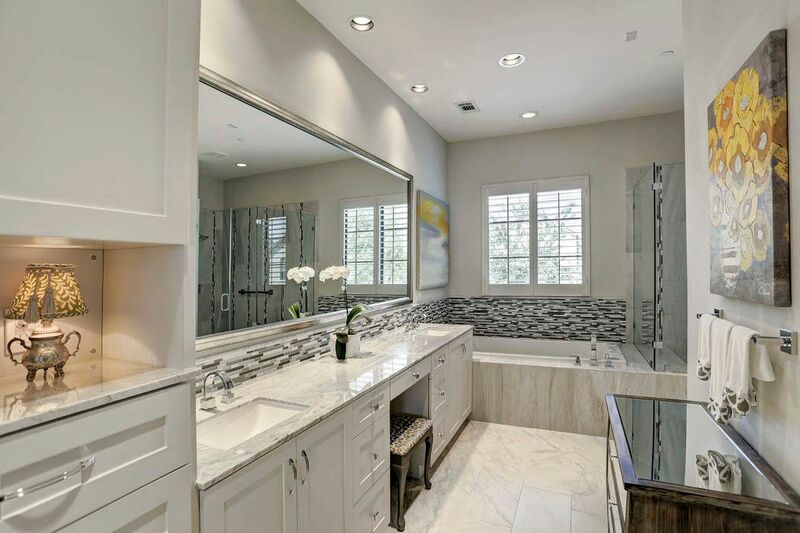 Large master suite/marble bath. No flooding.